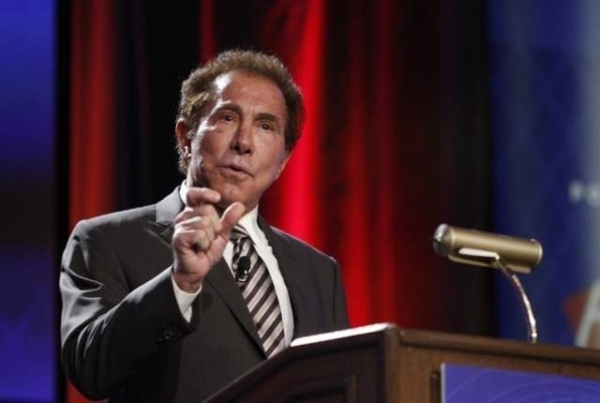 Steve Wynn said Thursday that Macau might be on a rebound and that was good enough for the investment community. Shares of Wynn Resorts Ltd., as well as other Macau casino operators, shot up in value Friday on the company chairman’s rosy outlook and the potential business coming from the Chinese New Year celebration, which began this week. Macau has suffered through 20 straight months of declining gaming revenue totals, brought on a poor Chinese economy and Beijing-mandated crackdown on corruption that has ensnared operators of high-end junket businesses tasked with bringing big-spending gamblers to Macau’s private gaming salons. The comments sent shares of Wynn, traded on the Nasdaq, up $9.45 or 15.83 percent Friday, to close at $69.14. Prior to Thursday’s close, Wynn Resorts had fallen about 14 percent this year, compared with a 15 percent decline in Dow Jones U.S. Gambling index. The stock price in Las Vegas Sands Corp., the other dominant Nevada casino operator in Macau, also rose $3.84 or 9.54 percent, to close at $44.09 on the New York Stock Exchange. MGM Resorts International, which operates one Macau casino, closed at $18.11 on New York Stock Exchange, up $1.18 or 6.97 percent. But analysts were still wary. “We recommend investors maintain patience until there are further policy announcements from the Macau government in addition to post-Chinese New Year trends,” said Macquarie Securities gaming analyst Chad Beynon. Wynn Resorts told investors its Wynn Macau and Encore operations saw overall revenue decline 27 percent in the fourth quarter. But Steve Wynn said the company was working closely with its contractor to complete the $4.1 billion Wynn Palace on the Cotai Strip by its planned June 25 opening. Las Vegas Sands plans to open $1.7 billion Parisian development in September, and MGM Resorts wants to open the $3.1 billion MGM Cotai by the end of the year. Deutsche Bank gaming analyst Andrew Zarnett told investors that despite the positive tone, he is still cautious about the Macau market, especially with the added capacity by the new resorts.